Vision and mission statements are essential to explain the aims and objectives of an organization and to elaborate upon future goals. A mission statement plays an important part in the corporate culture and is essential for communicating important information about a company to its stakeholders, including employees, shareholders, investors and customers. Similarly, a vision statement elaborates upon the future course of action that the company intends to take. There are many examples of how organizations have been able to motivate their workforce using their mission and vision statement, as well as attain goodwill from customers. Amazon.com for example, had a policy where its employees could potentially become shareholders which resulted in employee motivation. It is not only essential that you create a meaningful mission statement and lay out a vision for your company’s future endeavors but also essential to present it in an appropriate manner. This is why you should pick and choose content for your slides carefully, such as a good template that can help you present your ideas clearly. 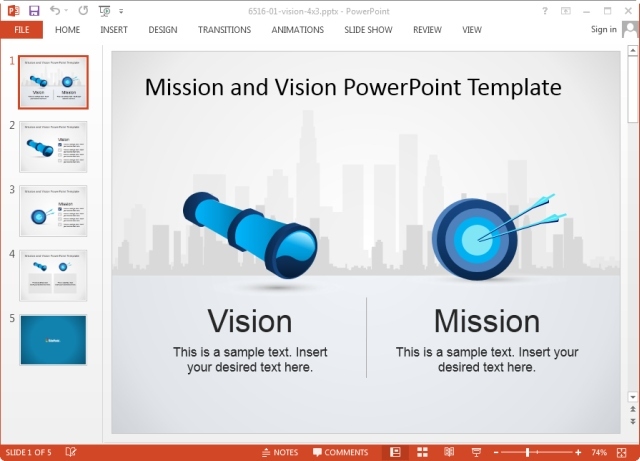 The Mission & Vision PowerPoint Template is a Corporate Presentation Template that can help you do just that. 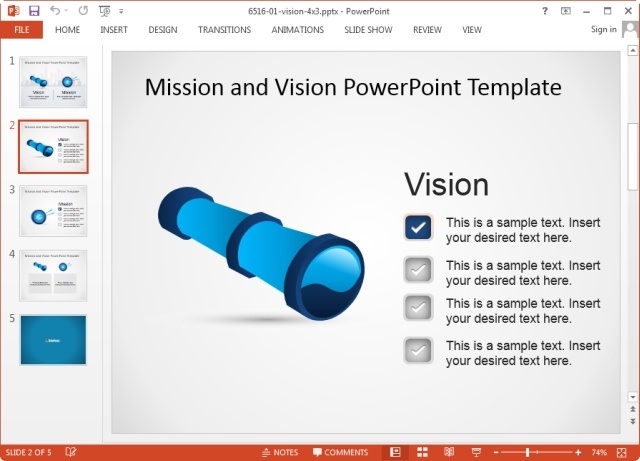 The Mission and Vision PowerPoint Template has been crafted by expert professionals to make it possible to present a mission and vision statements with the aid of interesting and attractive layouts. 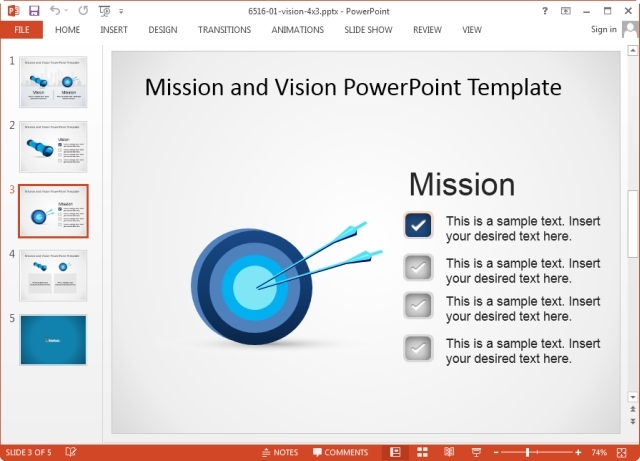 Whether you are searching through mission and vision statement examples or have your statements laid out clearly, you can use the simple, yet elegant images in this PowerPoint Template to your advantage by simply adding text to sample slides. The template is flexible enough to help you make a presentation with both a mission and vision statement, as well as to create individual presentations separately for presenting your mission statement and vision statement. 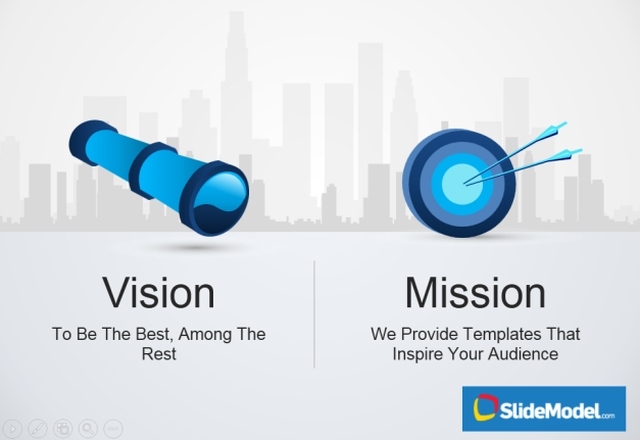 The template starts with an opening slide with a Telescope presenting “vision” and a Bullseye with arrows presenting “mission” symbolically. The following slides offer both individual pages for elaborating upon you vision and mission statement, as well as to present them side by side. In case you wish to present only a mission or a vision statement, you can easily remove and adjust the given clipart images and textboxes, as well as seamlessly integrate your own content, such as photos, company logo, GIF animations, etc. 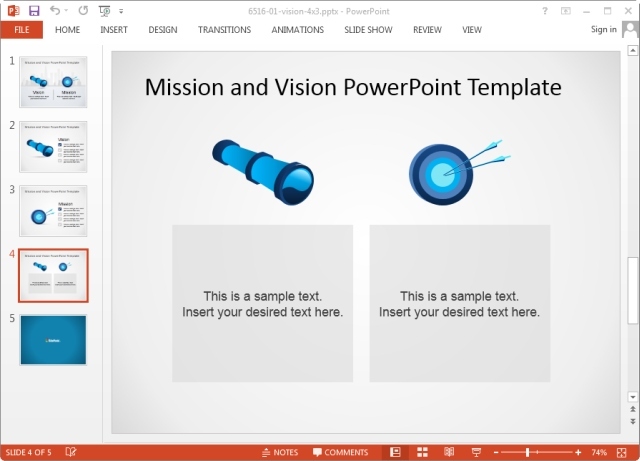 Mission and Vision PowerPoint Template can be downloaded in both Standard and Widescreen formats. You can download this and thousands of other amazing PowerPoint Templates by subscribing for a SlideModel package. To download more than 7000 templates, see our Unlimited Download Access Plan. 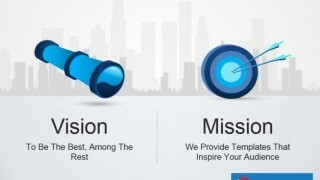 Tags: Business PowerPoint Templates, Business Presentations, Mission Statement, Templates, Vision Statement.